One of the things that the 3day taught me this year is that everyone has a story. Yes, all the stories at the 3day were about breast cancer…stories of loss, survival and everything in between. Some stories were shocking, others were sad and still others were inspirational. What I realized is that we ALL have a story to tell. In fact, we all have many stories to tell. Every one of us has gone through something that has changed us, broken us, helped us grow, changed our future, opened doors, softened our hearts or hardened them. 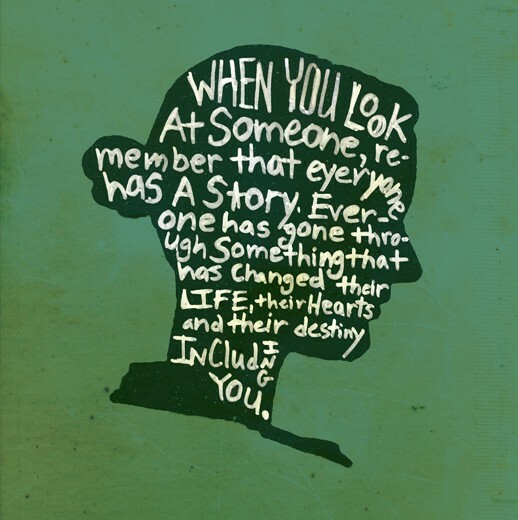 Sometimes we get so caught up in our own stories that we fail to notice that everyone has something to share. At the beginning of the 3day they ask us to make a promise. The promise I made this year was to not make the event be all about ME. In the past year I added an additional chapter to my life story. It’s quite a dramatic story…not too sad but kind of intense. People need to hear my story but sometimes they don’t need to hear it more than they need to share theirs. I want to share my story because I am proud of it. But more importantly I want to share my story because I think it will save other people’s lives. I don’t know that I’ll ever know if my story in fact saved someone’s life as I still don’t have the ability to tell the future. I do know that for the possibility of that happening though…it’s worth any criticism I get about speaking out. It’s worth any amount of strange comments from people trying to relate to my situation. I also have many other stories to be shared…some are happy and some are sad. And for every person I encounter there is something that has changed them…deeply. That funny, sweet fella with glasses….he lost the love of his life and their future just as they were starting their story. That compassionate, selfless family who is always willing to lend a hand…they had a daughter born needing a new heart and even that wasn’t enough to keep her around. That sarcastic, confident woman who’s always online…she’s grown into an amazing woman despite the crappy men who have tried to keep her down and she’s raising a pretty awesome son too despite what a tough life she’s had. That beautiful, athletic woman you see running your neighborhood…she almost lost her son in a car crash and he’s still struggling to get back to ‘normal’. Are you taking the time to know their stories or are you too busy comparing yourself to them on the outside, being critical or just talking about yourself? You might know their story…but you might not. Take the time to be a listener…and if you’re brave enough…take the time to tell your own stories.